It's been open for almost a month now... and we're just getting to the review. There's a reason for that though... the place has literally been to busy to find an open space to eat! I mean... we're talking about lines out the door and parking lots so full that they are overflowing into surrounding businesses lots. 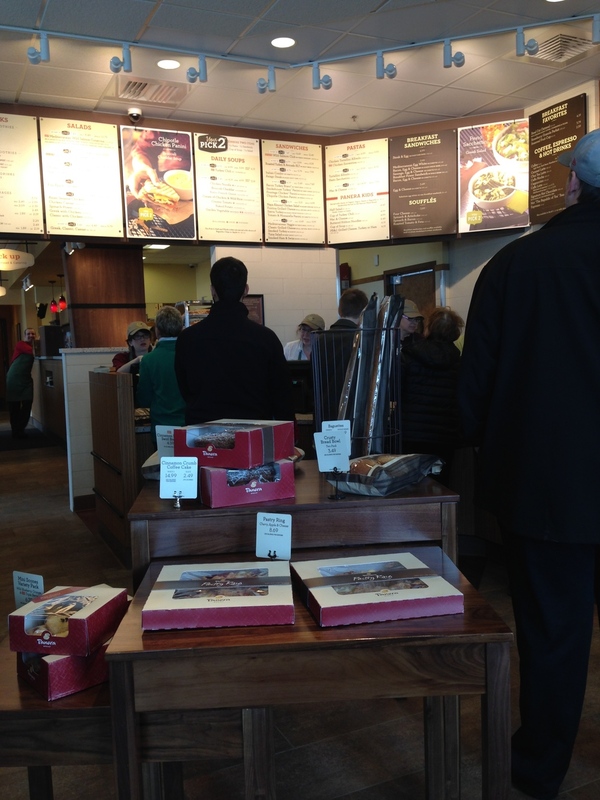 We finally ventured out to Panera Bread, determined to find an open table this time. When we did we were pleasantly greeted with everything we have learned to love about Panera Bread. Duluth's (and the Northland's) first Panera Bread is located within the Hansen Center, a new retail development located off of Maple Grove Road. This location is set up a little differently than most Panera Bread locations we have been to in the past as not only does it have a drive thru, but it also is a production facility. The building itself is basically split in half... with half being dining space and the other half being used for production. It seems that when new restaurants and retailers come to Duluth they under estimate the amount of traffic their locations will see. So that means that they often design their buildings and spaces on the smaller side of things (we saw this with the first Noodles & Company location), and unfortunately we see that happen with the new Panera Bread location. In our minds we think it wouldn't have hurt to have built a little more dining space as it was quite cramped when we came and that was mid afternoon on a weekday. But let's be honest, we're just thankful to finally have a Panera Bread up here. What's nice about the Duluth location is that from the moment you enter the door you're immersed in baked goods. The ordering area features walls lined with baked breads and goodies, along with display space abutting the que line area. There's also bar seating along the window area and in front of some of the baked goods display area. The cash registers are squeezed pretty tightly together.. so make sure you pay close attention to where you're standing so that you are in fact in line to order and not in a crowd of people admiring baked goods. Some people get quite aggressive for those deliciously baked Panera Bread goods. From the registers there is a corridor that runs along the prep area where you eventually will pick up that delicious salad, soup, or sandwich (or both) of yours. Conveniently the restrooms are located down this corridor in case you need to make a pit stop before you pick up your food. A self service soda machine is located adjacent to this area, along with utensils and other necessary dining materials. The dining area is spacious in a horizontal sense... if that makes sense. It runs the whole length of the building and is pretty skinny. We didn't see a seating count of how many occupants could fit in the space, but we are assuming it must be under the 75 mark. We could be mistaken though. Art work covers the walls which are painted in neutral tones, while modern light fixtures hang from the ceiling and walls. A mixture of wooden tables, chairs, and booths, covered with accents of brightly colored fabrics fill the space. A fireplace divides part of the dining spaces, while wooden shutters separate the pick up area from the dining area. Our thoughts on the space? It's beautiful and very fitting for Duluth. It's great that Panera Bread has finally decided to call Duluth home and we fully believe that Duluth will welcome Panera Bread in with wide open arms... and empty bellies. We wish the space could have been a little larger, but understand there were many confining elements to the site. 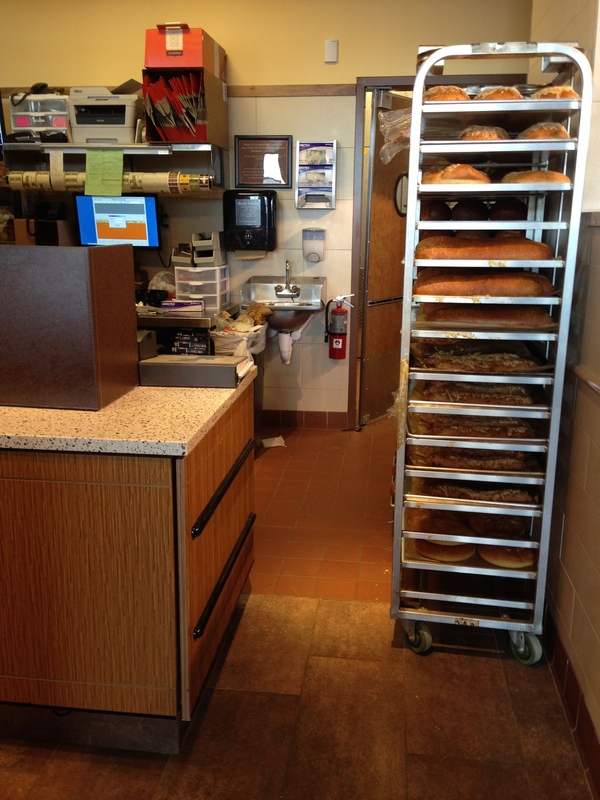 The staff at this particular Panera Bread were energetic, helpful, and overall knowledgable about their job. This location looks to be having great success so far and we firmly believe that it will continue to in the future. We also have heard that Panera Bread hopes to open additional locations in the near future in East Duluth, West Duluth, and Superior, which may help with the lack of parking and dining space. And last but not least... you want to see what we ate right? Well... it's always smart to go with the Pick Two option! This is what we chose!